Left: BRAFV600E A375 cells expressing pLKO or shMED12 vectors were cultured in the absence or presence of 2.5 μM PLX4032 or 0.5 μM AZD6244. The cells were fixed, stained, and photographed after 10 (untreated) or 28 days (treated). Right: A375 cells expressing pLKO or shMED12 vectors were grown in the absence or presence of 1 μM PLX4032 or 0.5 μM AZD6244 for 6 hr. Phosphorylation of PPARg in epididymal white adipose tissue in ob/ob mice after treatment with MEK inhibitors. Gene expression in ob/ob epididymal white adipose tissue after treatment with vehicle or either of two MEK inhibitors, PD0325901 or GSK1120212 (n = 7, 7 and 8, respectively). Areas under the curve and gene expression were analysed by analysis of variance. 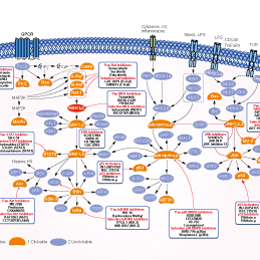 Melanoma cell viability and in vivo growth by cyclindependent kinase 2/4 inhibition. Western blot analysis for c-Jun, phosphorylated-ERK1/2 (Thr202/Tyr204) (p-ERK1/2), and total ERK1/2 protein levels was done for human melanoma cell lines treated with the BRAFV600E inhibitor GDC-0879 (1 μM), or MEK inhibitors CI-1040 (1 μM), U0126 (1 μM), and PD98059 (10 μM) for 18 hours. BIX02189 is a selective inhibitor of MEK5 with IC50 of 1.5 nM, also inhibits ERK5 catalytic activity with IC50 of 59 nM in cell-free assays, and does not inhibit closely related kinases MEK1, MEK2, ERK2, and JNK2. Pimasertib (AS-703026) is a highly selective, potent, ATP non-competitive allosteric inhibitor of MEK1/2 with IC50 of 5 nM-2 μM in MM cell lines. Phase 2. Western blot of brains of mice (WT mice received p.o. administration of 1, 2, or 5 mg/kg pimasertib. Data are means±SD; n54; *p<0.05, **p<0.01, ***p<0.001, ****p<0.0001. Retrograde NGF increased BDNF expression in sensory neurons, which was mediated by the MEK/ERK pathway. In two-compartmented DRG-nerve culture, NGF (50 ng/mL) was added to the chamber containing the sensory axonal terminals. The expression of BDNF was examined in the DRG neuronal soma located in another chamber. After 12 h of NGF treatment, the level of BDNF was increased in the sensory neuronal cell bodies by 3 fold (compare B to A) when compared to control (E). The role of the MEK/ERK pathway in retrograde NGF-triggered BDNF up-regulation was determined by pre-treatment of the ganglia with inhibitors U0126 (C), PD98059 (D) or BIX02188 (E). All inhibitors signiﬁcantly reduced NGF-evoked BDNF up-regulation in the ganglia when compared to vehicle treatment (F). Results were from 4 independent experiments for each treatment. Bar=80 μm. *, p＜0.05 vs all groups. TAK-733 is a potent and selective MEK allosteric site inhibitor for MEK1 with IC50 of 3.2 nM, inactive to Abl1, AKT3, c-RAF, CamK1, CDK2, c-Met, etc. Phase 1. (c) Fold induction of apoptotic cells after 3-day compound or vehicle (DMSO) treatment, as measured by annexin V positivity. Error bars indicate s.d. 's (n=4). **P<0.01, ***P<0.001, two-way ANOVA with Holm Sidak multiple comparisons correction. iKras p53L/+ cells were treated with AZD8330 (50 nM), BKM120 (150 nM), or Rapamycin (20 nM) for 18 hr. As control, cells were cultured in the presence or absence of doxycycline for 24 hr, and cell lysates were blotted for phospho-Akt, phospho-Erk, phospho-S6, and Myc. Whole-cell lysates from NRAS- or BRAF-mutant melanoma cells treated with encorafenib or/and binimetinib or DMSO as a control for 24 hours were subjected to Western blot analysis to detect pERK, ERK, and b-actin. The experiment shown is a representative of three independent experiments. PD318088 is a non-ATP competitive allosteric MEK1/2 inhibitor, binds simultaneously with ATP in a region of the MEK1 active site that is adjacent to the ATP-binding site. After starved in serum-free medium for 24h, T47D cells incubated with the indicated concentrations of PD318088 for 3h,followed by 20-minute stimolation of 100ng/ml EGF. SL327 is a selective inhibitor for MEK1/2 with IC50 of 0.18 μM/ 0.22 μM, no activity towards Erk1, MKK3, MKK4, c-JUN, PKC, PKA, or CamKII;capable of transport through the blood-brain barrier. RDEA119 (1 µM) or JTP-74057 (0.1 µM) abolished the effects of G1 on DAPK1 and NR2B phosphorylation. Myricetin, a natural flavonoid with antioxidant and anti tumor properties, is a novel inhibitor of MEK1 activity and transformation of JB6 P+ mouse epidermal cells. It also inhibits PI3Kγ with Kd of 0.17 μM. Three types of selective inhibitors of MAPK signaling produce expected differential kinase inhibition and activation responses in HCT116 colorectal cancer cells. HCT116 cells were treated with 250nM of GDC-0973, GDC-0623, SCH772984 or DMSO for 1, 4, or 24 hours. In the washout samples, cells were drug treated for 24 hours, then changed into fresh media and harvested after 0.5 or 2 hours. Lysates were used for western blots of total and phosphorylated MEK, ERK and RSK; blotting for COX IV was used as the loading control. APS-2-79 is a MAPK antagonist that modulating KSR-dependent MAPK signalling by antagonizing RAF heterodimerization as well as the conformational changes required for phosphorylation and activation of KSR-bound MEK. IC50=120 ± 23 nM.